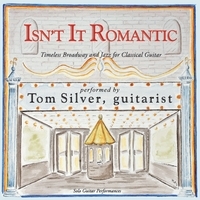 Classic Broadway and Jazz arranged for solo classical guitar. Stroll back in time to one of America's great contributions to world culture – home grown jazz and our musical theater (most songs here are of American origin). Many locales in these shows are uniquely American – among them the Mississippi River of Show Boat (“Can’t Help Lovin That Man”), the New York garment district suggested by The Pajama Game (“Hey There”), the West of Oklahoma! (“People Will Say We’re In Love”), and of Annie Get Your Gun (“They Say It’s Wonderful”), and the American South of Porgy and Bess (“Summertime”). But the themes – love, sparring of the sexes, race, tradition, injustice – transcend time and place. The greatest songs fuse music of exquisite beauty with lyrics unimaginable other than as written. Oscar Hammerstein II as lyricist was every bit the equal of Richard Rodgers as songwriter, and “Rodgers and Hammerstein” will be around as long as there are people who love music. It took decades before this great music again caught my attention, after I saw the film version of Showboat and a Broadway revival of Annie Get Your Gun. But this time I was hooked for good. It took even longer for great jazz songwriters like George Gershwin and Jerome Kern or performers like Louis Armstrong to invade my consciousness, but invade (and conquer) they did. This great body of music - Broadway and Jazz together or apart - became my own answer to the question of what it means to be human. (“They say that falling in love is wonderful, wonderful...in every way...so they say” - Track 12.) I hope at least some of this comes out in the interpretations on this album.